Safety gloves find the number one place in the safety essentials list. Every job that puts the employees at the risk of considerable damage to their arms and hands requires suitable safety gloves in addition to other accessories like the safety goggles and other protective gear. Though there are a wide variety of safety gloves available, the nature of the work and the possible hazards must be taken into account while selecting the right pair of gloves. Goatskin leather is widely used to manufacture leather gloves that are used in welding. These are suitable for work conditions that might cause hazards like cuts, abrasions and burns. These are ideal for extreme conditions. 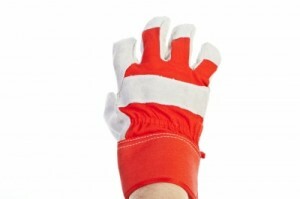 These are simple general purpose gloves used for normal jobs. They offer protection against dirt and cuts but do not work well for industrial purposes. These gloves are thicker and protect from chemical hazards. Normally, they are discarded after a one time use to ensure better safety. Latex gloves and Nitrile gloves are used by healthcare providers. Other materials available are neoprene, Norfoil, Viton, Butyl rubber, PVC, PVA, Stainless Steel and Kevlar. Insulating rubber gloves are used by electrical workers to get protection from various electrical hazards. Consider the following factors before choosing the right pair of gloves. Identify the substances that you handle. Harmful chemicals can burn your skin. Choose a glove that gives you the needed protection as long as you are exposed to toxic chemicals. If you work for prolonged hours under wet conditions, use waterproof gloves that protect you from conditions like dermatitis. Long time exposure to harmful substances and handling heavy loads require thick gloves. Thin gloves tend to tore apart and will not last longer. Choose thick gloves of the right size to get long time protection. Identify all the possible physical hazards like cuts, burns, abrasions and frostbites. Choose gloves that have resistance to mechanical and thermal hazards. Gloves are available in two lengths. They protect the hand, arm or forearm. Choose the one that you require depending upon your work requirements. Try on a couple of gloves to find if it fits correctly. Gloves that are too tight will cause you discomfort in handling. Moreover, you might sweat while wearing them for long hours. Under such conditions, you may not be able to grip the objects firmly. Gloves that are too large will not help either. You can wear an extra pair of cotton gloves and then wear the protective work gloves on top of that. This will promote comfort as it absorbs all the sweat. It is good to remove your gloves once in a while to let some air circulation. Choose your safety gloves after examining if your pair of gloves acquires all these properties to ensure convenience and better protection while working. © Copyright, Gajsupply.com All Rights Reserved.